You are here: Home / Bathrooms / What Can You Do With Ugly Tile Walls? What Can You Do With Ugly Tile Walls? Your bathroom is a place where you rejuvenate, relax and refresh. It’s a room you should love. So, what do you do if you don’t love your ugly tile walls? What do you do with tile with outdated colors, grout lines that are cracked, stained, or moldy? You can tear out the existing tile and replace it with something else, but that’s messy, time-consuming and expensive. At Miracle Method Surface Refinishing, we have a quick, clean, and affordable option for you. Don’t retile your walls. Instead, have the existing tile refinished. First, we use a two-step cleaning process to remove any dirt, oil, and other residue from the tile walls. We repair any cracked or damage tile. Then, we “float” additional grout over the existing grout, if necessary, to fill any voids and create a smoother appearance. Once the grout is dry, we clean the tiles again and apply our MM-4 bonding agent to ensure that the new finish will adhere to the old. Finally, we apply our hi-tech acrylic coatings to produce a smooth, durable, even finish. Miracle Method offers an extensive collection of colors and textures to choose from, including our Natural Accents™ stone finishes, so you can perfectly match your bathroom décor. 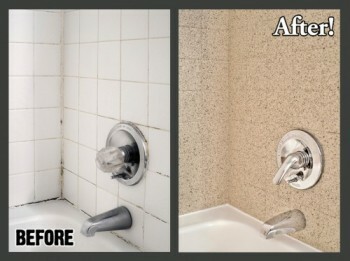 Refinishing tile walls also permanently seals the grout, eliminating the need to clean or regularly seal it. Why bother with messy and expensive removal and replacement of ugly tile and grout when Miracle Method can refinish them quickly, affordably, and beautifully? To learn more about our process, please visit our website at www.miraclemethod.com or give us a call at 855-212-7337 for more information. Your Miracle Method professional can offer the best pricing if you have both the bathtub and tile walls refinished at the same time. We can even finish the bathtub and walls in contrasting colors. I didn’t even know you could refinish tile until I read this article. I have a bathroom that is in really bad shape right now and I need to make it look like new for some family that is going to be staying with us for a while. I am definitely going to be looking into this! 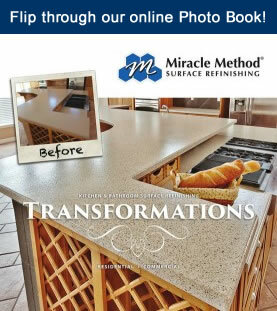 Thank you for your interest in Miracle Method Surface Refinishing! Refinishing can transform your bathroom to look and feel like new again in as little two days or less – just in time for your guests!